For the convenience of users in the OpenWebGIS the weather module has been recently updated to visualize the weather on the map from two sources, that offer free API for everyone. 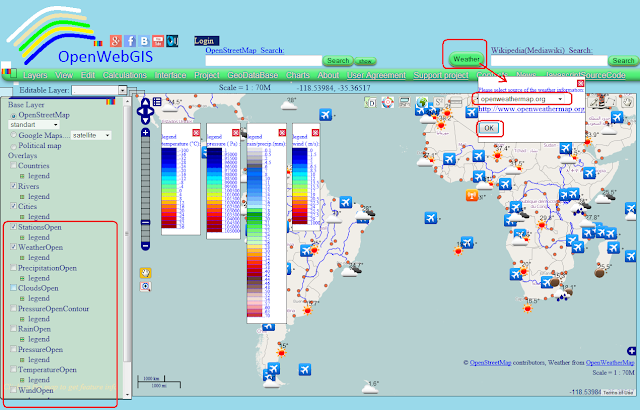 In the article "The meteorological service based on OpenWebGIS" there was an example of the use of meteorological information in OpenWebGIS from external sources (WMS layers). In this example layers were added using the menu item "Layers-> Create and add new Layer from WMS URL" (See Figure 1). Layers legend was added in the form of images using the menu item "Layers-> Create and add new Layer from Image file". 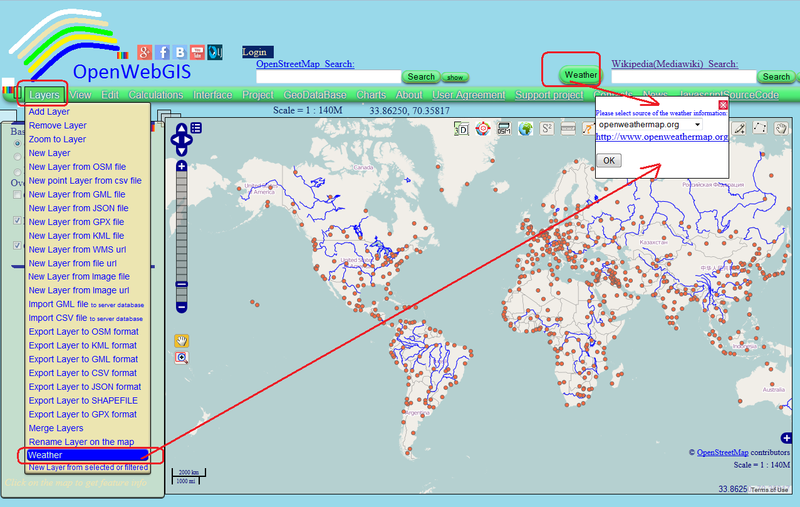 The above example shows that each user of OpenWebGIS can create their own service based on OpenWebGIS from the desired sources. Besides this method of adding data about the weather (of course the data can be added not only about the weather) for the convenience of users in the OpenWebGIS weather module has been recently updated to visualize the weather on the map from two sources, that offer free API for everyone. Weather API (application programming interface) allows developers and programmers to access current, past and future weather data for use in apps and on websites. 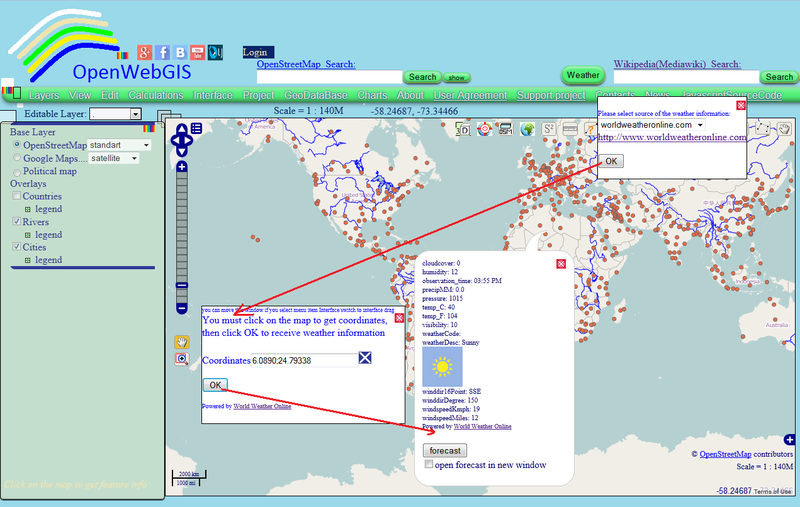 Weather information is taken from two sources: http://www.worldweatheronline.com and http://www.openweathermap.org. Select them by using the menu item "Layers-> Weather" button or "Weather". (See Figure 2). 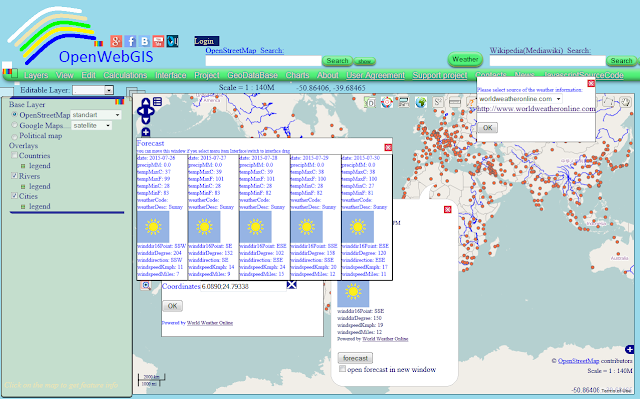 In OpenWebGIS with the help of a source www.worldweatheronline.com you get access to the weather at any point given by you on the map (in this case the nearest weather station is automatically found and the data, that it provides, is displayed). 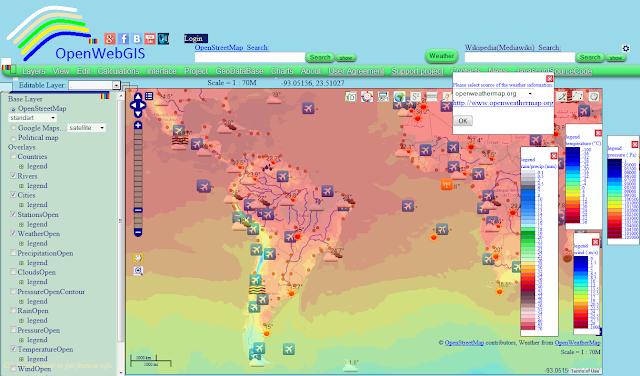 Click on the "Weather" button, then a pop-up window appears where you can select worldweatheronline.com as a source of the weather information. Click "OK" button, after that there will be an additional window where you can enter the coordinates you are interested in (in the format of longitude; latitude), or simply click on the map. (See Figure 3). Then in this additional window click "OK" button and you will get the current weather at this point as it is shown in Figure 4. To get the weather forecast at this point, click "forecast" button and you will get the result as in Figure 5. 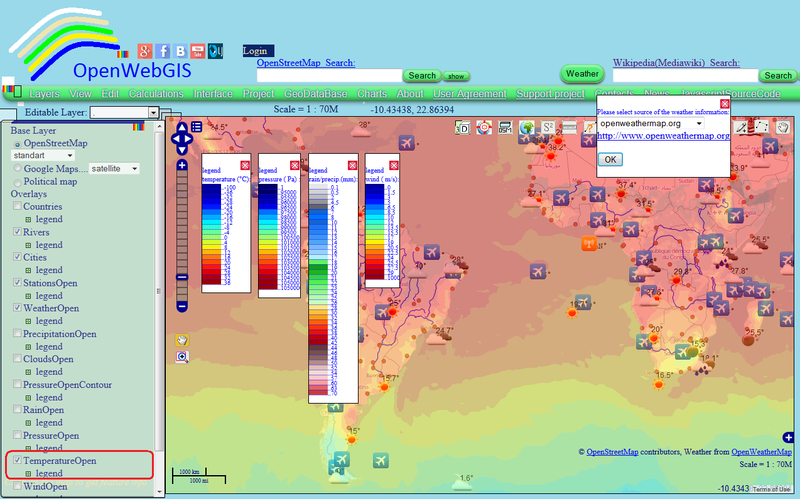 In OpenWebGIS with the help of a source www.openweathermap.org you get access to the weather in specific locations and spatial distribution of meteorological parameters such as precipitation, rain, snow, clouds, sea level pressure, sea level pressure contour, temperature, wind speed. To get this information click "Weather" button, then there will be a pop-up window where you can select openweathermap.org as a source of the weather information. 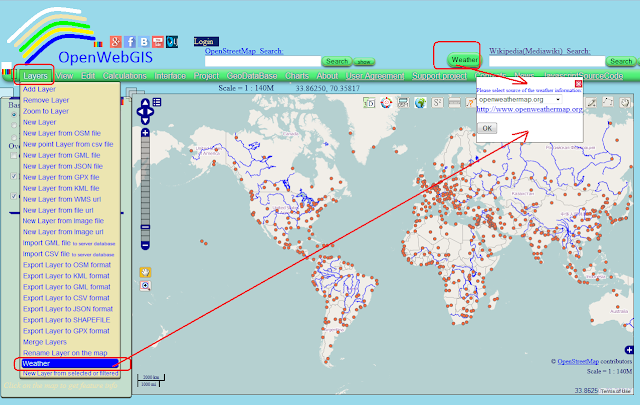 Click "OK" button, and then in the list of layers to the left of the map all layers will be immediately added. They contain the information about the weather and on the map places markers are put where the data from meteorological stations is available. (See Figure 6). 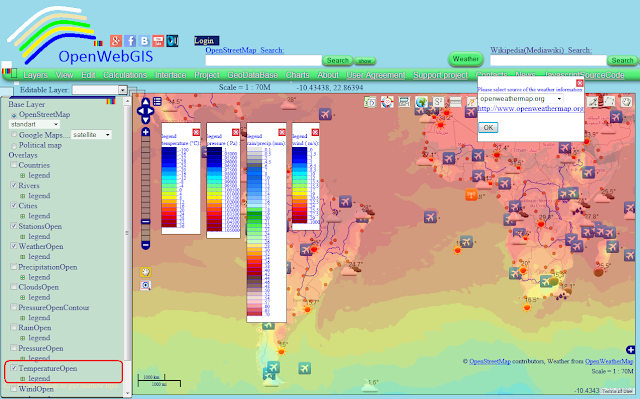 In the layers list activate the layer you are interested in (tick the layer name) and the data in the form of spatial distribution will appear all over the map (for example, temperatures distribution, see Figure 7). You can drag the windows with legends of weather layers in any place, if you click on the menu item "Interface-> switch to interface drag". (See Figure 8). 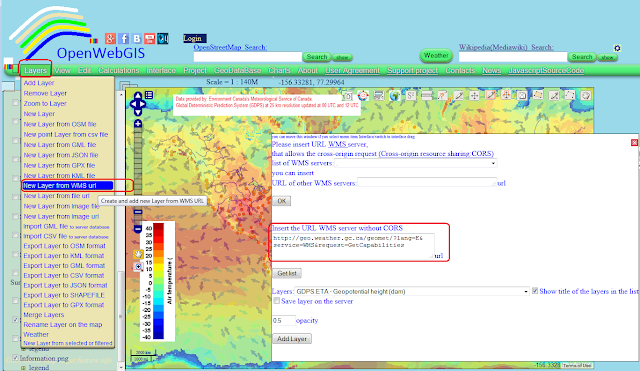 To receive the weather in the presence of local weather stations, select the layer name "StationsOpen" "WeatherOpen" (current weather for cities) in the list of "Editable Layer". Then click (on the map) on the point (icon of sun, clouds and so on) you are interested in. The values ​​of all attributes of the point you can see by hovering the cursor over it and clicking on it (if while hovering over a feature, it is not activated, then move the map a little bit and then again hover the cursor). After clicking on the feature you are interested in, the pop-up window will be opened. In this window you will see all weather attributes. (See Figure 9). You can look at the ready weather map (created on the base of www.openweathermap.org) with the activated wind layer at this link. 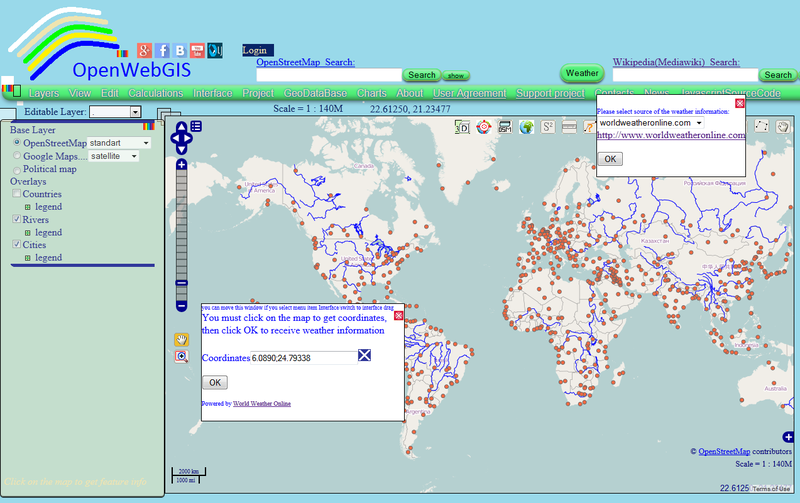 You can read about creating a web-link to the map in this article http://openwebgis.livejournal.com/12177.html. 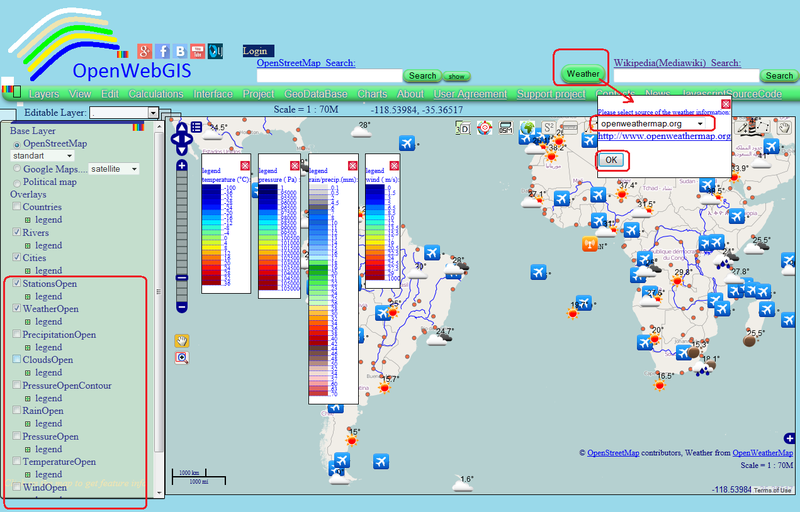 Read about embedding maps created with the help of OpenWebGIS in your websites or blogs in this article: http://openwebgisystem.blogspot.ru/2015/04/blog-post.html. 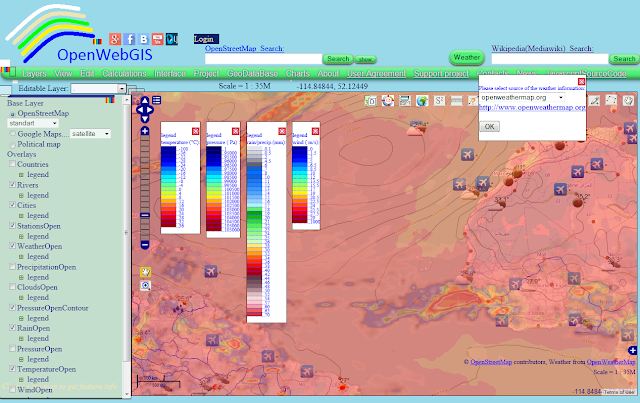 The users of OpenWebGIS can offer some other open sources of weather information. 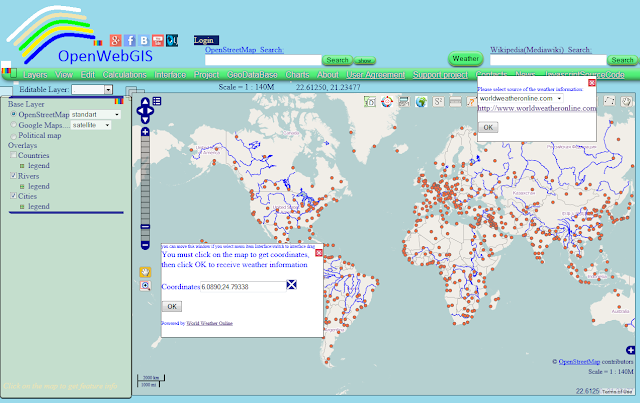 Write about it in the comments and if it is possible the access to them will be added to OpenWebGIS. 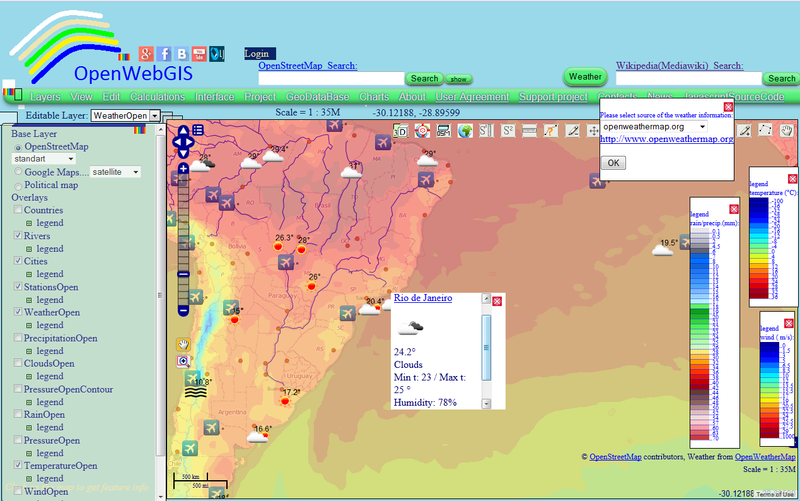 The advantage of weather data visualization in OpenWebGIS, compared to many other existing online weather services, is that the users of OpenWebGIS can not only view the data, but they also can put any their layers (containing any information, not only the weather) and analyze simultaneously the information from different sources.